Nintendo jumped onto the toys-to-life bandwagon in a huge way with their amiibo figures, which were first introduced for the Wii U console. The figures were also compatible with the 3DS via a peripheral, and the New Nintendo 3DS hardware revision included a built-in near field communication (NFC) reader capable of scanning amiibos. When Nintendo moved on from the Wii U to the Switch, amiibo also made the jump into the next console generation. 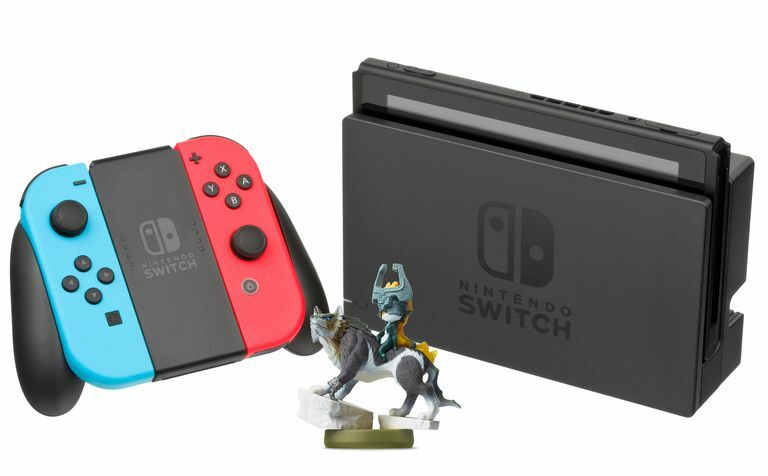 All of the old amiibo figures that were released alongside the Wii U work just fine with the Switch, and Nintendo continues to release brand new figures to support Switch games like Super Mario Odyssey and The Legend of Zelda: Breath of the Wild. Scanning an amiibo with a Nintendo Switch is easier than ever before. With the Wii U, the scanner is located on the GamePad, which is inconvenient for players who prefer to use a Pro Controller. Similarly, the 3DS uses a separate peripheral for scanning, and the New Nintendo 3DS requires the player to obscure the lower screen with an amiibo in order to scan it. There are two places that you can scan an amiibo on a Nintendo Switch, depending on the controller that you are using. If you're using the Joy-Con controllers, you can scan an amiibo by touching it to the right joystick, which is located on the right Joy-Con. This works regardless of how you are using the Joy-Cons. They can be connected to the Switch, plugged into a controller frame, or held separately, and still read an amiibo. If you're using a Pro Controller, you can scan an amiibo by touching it to the Nintendo Switch logo on the front of the controller. This allows players to take advantage of in-game bonuses, like invulnerability in Super Mario Odyssey, regardless of the controller they are using. Amiibos can be scanned with the right Switch Joy-Con or the Pro Controller. Make sure that your Switch has the latest system update installed. Launch an amiibo-compatible game and follow any in-game instructions pertaining to amiibo use. Touch your amiibo to the NFC reader on the right Joy-Con or a connected Pro Controller. Joy-Con - The NFC reader is located on the Switch right control stick, which is located on the right Joy-Con. Pro Controller - The NFC reader is located at the Nintendo Switch logo, which can be found on the front of the Pro Controller between the - and + buttons. Amiibos only work with specific Nintendo Switch, Wii U, and 3DS games. Nintendo maintains a full list of all amiibo-compatible games. Consult this list to see if your game works with amiibos and whether your amiibo works with that game. While the basic process of scanning an amiibo doesn't change from one game to the next, each game does have a specific procedure you need to perform before you can actually scan an amiibo. The method of scanning an amiibo in any given game is typically laid out in the included documentation, and most games also have an in-game tutorial that shows you how to start the scanning process. Press and hold the up button on the left Joy-Con d-pad or the Pro Controller d-pad. Press the left shoulder button. The ability to scan an amiibo in Super Mario Odyssey isn't available when you first start playing. Before you can take advantage of this feature, you'll need to beat the first two kingdoms. When you arrive at the Sand Kingdom and beat the Broodals, you will find a Toad hanging out near your ship. Press right on the d-pad located on your left Joy-Con or Pro Controller. You can only scan an amiibo while in a stage, so it's a good idea to only use one when you plan on playing through the entire level. Scanning an amiibo will provide you with food, lives, stars, and illustration pieces. Start a game in Story Mode. Start a level, and press the + button. Select yes to confirm amiibo use. Go to Inkopolis Square and look for the amiibo box near the yellow truck. Stand in front of the box and press the a button. If the amiibo hasn't been registered on your Switch yet, select register. If the amiibo has already been registered on your Switch by a different user, you'll have to reset the amiibo data before you can register it yourself. Select do it for me. Scan your amiibo again to befriend your amiibo in the game. Launch the game and open the menu screen. Select magic from the menu. Press either ZL or ZR and equip amiibo as a power. Press either ZL or ZR depending on which one you mapped to amiibo. Scan a Twilight Princess Link, Toon Link, and Skyward Sword link to immediately unlock a full set of Link gear in the game. Scanning other Link amiibo figures provides other weapons and gear. You can scan amiibo figures to unlock weapons, but the feature isn't available until you complete the second chapter in the story mode. Follow the on-screen prompts and scan your amiibo..
You can scan up to five amiibo figures each day. Scanning a Fire Emblem Warriors Chrom or Tiki amiibo provides a unique weapon that is only available the first time you scan it. Other Fire Emblem amiibos provide random weapons, and other amiibos provide random other rewards. Scanning a Mario, Luigi, Peach or Yoshi amiibo will unlock weapons for that character. You can only scan one amiibo per character per save file. When a Switch fails to read a single amiibo, there may be a problem with that amiibo. If you run into a situation where your Switch won't scan any amiibo figures at all, there may be a hardware or software issue. Verify that you have followed the correct procedure for reading amiibo in your game. For example, to scan an amiibo in The Legend of Zelda: Breath of the Wild, you need to select use amiibo in the options, and then use the d-pad to select the amiibo scan ability. Make sure that your Joy-Con or Pro Controller is paired to the Switch. Pair your Joy-Con by physically sliding it into the connector on the side of the Switch. If you are able to navigate menus with the Joy-Con, it is paired. Connect a Pro Controller by placing your Switch into the dock and connecting the Pro Controller to the dock via USB cable. Pair a Pro Controller by opening the home menu > controllers > change grip and order, then press and hold the sync button on your pro controller. Make sure that you aren't trying to scan your amiibo with the left Joy-Con. Only the right Joy-Con has an NFC reader. You can tell the difference by looking for the Joy-Con that has a + button on it and using that one. Make sure that you are touching your amiibo to the right part of your controller. The NFC reader in the right Joy-Con is located in the analog stick, and the NFC reader in the Pro Controller is located under the Switch logo. If you have a second right Joy-Con or a Pro Controller, try scanning your amiibo with them. If you are about to scan the amiibo, then there is probably a hardware failure in the original Joy-Con. Try restarting the console. This can be accomplished by holding the power button down for five seconds, selecting power options, and then choosing to restart the console. After the console has restarted, check to see if you are able to scan your amiibo. Select System Settings on the Home menu. Follow the on-screen prompts if an update is available. If you try all of these suggestions, and your Switch still isn't able to scan amiibos, then there may be a hardware fault in your Joy-Con or Switch. In that case, you will need to contact Nintendo support to request a consultation or repair.